There’s a load of theories about where punk started. I suppose you can slice and dice it back to anywhere you want, Screamin’ Jay Hawkins or The Pretty Things, or endless garage bands from the mid 60′s. Most self appointed, gatekeeping journalists will flatter each other with either The Stooges or The New York Dolls. My vote goes to Suicide in the US and the Canvey Island bands in the UK, of which Dr. Feelgood were the first superstars. Their live show stoked Eddie & The Hot Rods and together they lit up London fast and raw. It was indeed the speed of sound and the sound of speed all at once. New bands that clutched to the past and stood in their way were mowed down flat. Hustler and Nutz for example. It was a fun time for house cleaning. Labels like Chrysalis had their rosters fossilized overnight. Seemed like the world turned from black and white to color. Every single released was a new high. Dr. Feelgood: Lee Brilleaux had a vocal style and stage presense not unlike Roger Chapman, and Wilko Johnson religiously perfected Mick Green’s jagged guitar style into his own. Their second album, MALPRACTICE, is a clean, articulate blueprint of the band’s attack and technique. But when Dr. Feelggod unleashed live, it was unstoppable. Seeing them between late ’75 through mid ’77 really was life changing. If you did, you’ll know how hearing their records now will still sound different to us, as opposed to those who weren’t as lucky. Over three decades later, that hasn’t changed. 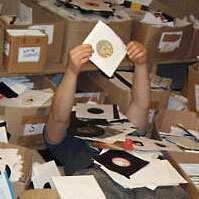 Not one for European pressings, I tell you honestly, my collection has less than a hundred. I make exception for singles like this, when not one but two 7″ worthy songs are issued on a 45. 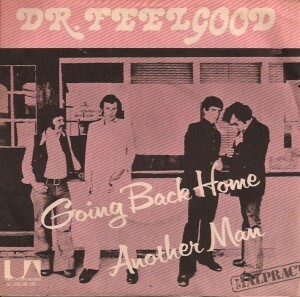 Both ‘Going Back Home’ and ‘Another Man’ (like ‘I Can Tell’, all from MALPRACTICE) were never released as singles in the UK or US. This Dutch pressing being the only exception to my knowledge. In fact, ‘I Can Tell’ has never come out on 7″ anywhere. How did the otherwise faultless Andrew Lauder mess this one up? Wait. Come to think of it, there were a few numbers from Brinsley Schwarz NERVOUS ON THE ROAD that deserved single status. Andrew Lauder you have some answering to do. 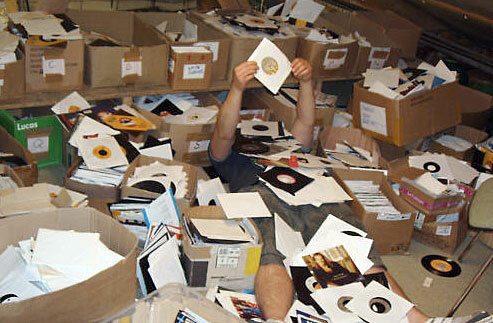 Being an archivist and collector can also mean you’re a pack-rat, depending upon whom you listen to. Ask Corinne for instance and she’ll pick door number three. Fine, I’m all of them and glad of it, having saved pretty much everything I’ve ever owned, starting with a rock that flew into my hand off my tricycle’s front wheel at about five years old. That’s how extreme, and far back, I can claim the obsession. Good thing, because the records began at age seven. Damn, if only I started at birth. In the case of this flyer, saving every last item allowed me to pinpoint the exact date and hour when a whole new musical world was revealed behind that invisible curtain. There had been a few jolting revelations before and several after, but that moment when rock as it had been known and loved immediately became the past occured on February 29, 1976. Dr. Feelgood were a blistering no holds barred introduction to pub and punk. Gone was the polish and self indulgence, the bloat and tired outfits. What the music world changed into we all know. It was a fantastic time to be young and insatiable. And here’s the flyer to stake that very date in my life. 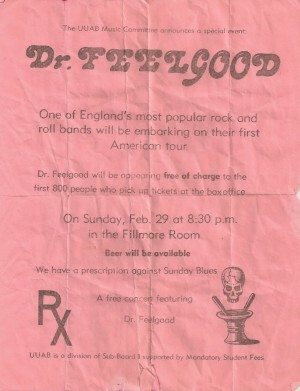 Corinne and I, with our dearest friend Karen Kasiner, braved a winter storm to see Dr. Feelgood. I wouldn’t trade that night for anything.